African elephants hate climbing hills because it is too costly in terms of energy, a study suggests. An international team used global positioning system (GPS) satellite tracking to follow the movements of savannah elephants. They found that the animals rarely visited high ground and scientists think this is due to the energy they must expend to climb the slopes. The research could have important implications for conservation. "[Elephants] probably take a rather different view of their surroundings than more lightweight animals", the scientists write in the journal Current Biology. African savannah elephants (Loxodonta africana) weigh about four tonnes and consume 42kg (90lbs) vegetation per day, including bark, fruit, grass and leaves. They normally forage for 16-18 hours each day. 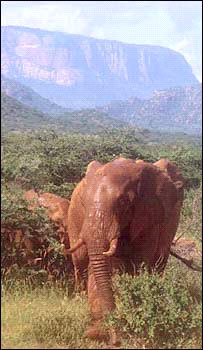 Roughly 5,400 wild elephants live in the Samburu, Isiolo and Laikipia districts of northern Kenya. The habitat studied by the researchers covered around 32,000 sq km (12,400 sq miles). 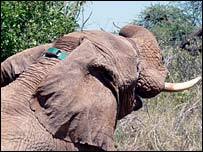 Zoologists put GPS collars around the animals' necks to track their movements. The collar reported an animal's location every three hours. Scientists found the elephants roamed over just 75% of the habitat. To move around their ranges, these giant herbivores used a network of "corridors" that avoided hilly ground. A 4,000kg (8,800lbs) elephant would need an extra 25,000 calories of energy for every vertical metre climbed - about 2,500% the cost of level walking. This means the elephants would need to boost their calorie consumption to walk uphill - requiring them to find much more food to eat. "Climbing is something that an elephant should not do lightly," said the zoologists. "The higher slopes tend to be forested. There are reasons for elephants to want to go up there," added Dr Douglas-Hamilton. "It is possible that these energetically costly forays are made to seek out vegetation or minerals that can only be found at higher elevations or on steeper terrain." One elephant in Kenya, nicknamed "Icy Mike" lived and died on Mount Kenya, 4.4km (14,000ft) above sea level. Dr Douglas-Hamilton said this unusual behaviour needed further research to understand. "Actually climbing down also requires quite a bit of energy for braking," he said. "What the elephant cannot do is to go up and down and engage in a costly energy-burning exercise." The savannah elephants are listed as "Vulnerable" according to the internationally recognised Red List. By understanding the animals' behaviour and preferences, scientists can help minimise the adverse impact of humans on the elephants. "What we are aiming to do is to reach a state in which human beings and elephants can live in harmony," said Dr Douglas-Hamilton. "The question is how to find enough space for both human and elephants. We can only do that by a very careful understanding of how the elephants take decisions and what they need."